It’s taking me a while to get my thoughts about The Hunger Games organized, so, in the mean time, I guess I’ll share some other things that I’ve been thinking about. If you are a regular reader of this blog, you may have noticed that, on the right side of the page, I provide a link to a blog called Reb Arthur’s Latest Thoughts. Reb Arthur is Rabbi Arthur Waskow, the founder of The Shalom Center, a Jewish advocacy organization that supports peace, social causes, and the environment. Reb Arthur has been at it for a long time — he worked with Martin Luther King, Jr — and is now a very old man. He has an email mailing list for those who like to know what is on his mind more frequently than he actually posts to his blog, and he sent a message a few days ago, that really should be shared. It doesn’t ask for any more comment than this simple introduction, but it resonates deeply with my state of mind today, so I will also tell you what I have been up to. A few weeks ago, within three minutes I received three Emails from three different people on the same subject. They all reported that they had just watched Oprah Winfrey’s interview of Gloria Steinem. At the very end, she had asked Steinem what moment of transformation she recalled in her life. Ms. Steinem responded that at the (in)famous Democratic National Convention in Chicago in 1968, when she was feeling deep despair, someone she hardly knew — Arthur Waskow — said to her that what she was doing really mattered, that she should keep on with her work for change. That, Ms. Steinem said, gave her courage. It was her life-transforming moment. That is, you never know what act of kindness, of decency, of hope, of perseverance might help to heal a person or the world. I called a friend of mine whom I knew was friends with Ms. Steinem. I asked her to call and give her my number; that I would very much like to be directly in touch with her. Fifteen minutes later, she called me, and we arranged what became a two-hour conversation at her home in New York. A delicious conversation. I was moved, was educated, was enchanted. Click here to arrange to see it. But more important, remember — You never know! Give your self over to a moment, and you might transform your self. Or someone else. Or the world. So, this morning, I uploaded some video I shot yesterday, and reviewed it, preparing for my first attempt ever at video-editing. The footage was of testimonial speeches that were given yesterday at a big family party that my wife organized in honor of her parents’ sixtieth wedding anniversary. The speeches were given by my two adult children, my brother-in-law, my sister-in-law, my wife’s uncle and aunt, and two of her cousins. You have to understand that my in-laws are very ordinary people. Yes, they are characters. Oh, how they are characters! But they worked at ordinary jobs, never owned or started a business, never were written up in the local paper. They raised three kids who support themselves in the same kinds of middle-class professions. But the testimonials! What these two ordinary people have meant to three generations, just by being there, being themselves, living their values, and helping out as needed –watching the kids, looking after the previous generation — they became ordinary heroes, and inspired many. It made me think about the party itself, and the more than eighty lives intertwined in the room and in life, what we have meant to each other, and continue to mean. I don’t just mean the obvious, like the inspiration between me and my kids, my wife, and so forth, or about helping a nephew through a crisis. What about my son’s girlfriend, who answered the phone and the door for one of our relatives who was in despair, and saved his life? How long will it take that young man or his mother to forget what she did — an ordinary young woman, an administrative assistant by trade? It is humbling to think of my lifetime in emergency services, my wife’s lifetime of teaching, my sister-in-law the social worker, my son-in-law the community organizer, to name just a few of the more obvious helping careers; how many lives have we impacted in ways we cannot imagine? How many opportunities have we missed? In my policing and EMS work, I have always tried to remember that what, for me, is a routine, repetitive work event, is, for the other person, a traumatic crisis they will never forget. Just today, one of my ambulance partners called me and said, Paul, did we recently take care of a cardiac case in Skyline Lake? A guy and his wife came up to me at the store, and were thanking me over and over again, and I don’t remember him! Writing about this is bringing more stories to mind. Back in the 1980s, when I was a patrol cop, one day I was sent to an injury in a park; a jogger and a bike had collided, and the cyclist broke his arm. One of the EMTs on the volunteer ambulance that came took me aside and said I remember you, but you probably don’t remember me. Do you remember about two years ago, going to a heart attack at Orchard Hills Golf Course? Did I remember? Yeah, it was the first time I had done CPR, and I was alone with the patient in the middle of a golf course, with only a small crowd of onlookers, for at least ten minutes before the ambulance and paramedics got there to help! The EMT continued: I was one of the bystanders, and I watched you do CPR forever, then saw what happened when EMS got there, and I wanted to be able to help, and to do those things too, so I joined my local ambulance corps and became an EMT. We hadn’t been able to save the guy who had the heart attack on the golf course, but who knows how many lives the man we inspired saved during his volunteer career? And that story reminded me of an old Quaker story, about an early nineteenth century Quaker named Stephen Grellet. One day, he experienced a spiritual nudge to make a pastoral visit to a logging camp in the remote woods of western Pennsylvania. He traveled many miles on foot to the camp, but, when he got there, found that the loggers had moved on, and the camp was deserted. He prayed about what to do, and felt led to speak right then. So he stood in the middle of the deserted camp, and gave a heartfelt sermon to the wilderness. It was many years later when he made a trip to London; while he was walking across London Bridge, a stranger came up to him and said I know you! The man explained that, years earlier, he had been traveling alone through the forest, and had seen Stephen preaching to the empty camp. He had hidden and listened, and what he heard had changed him and changed his life. It all comes back to what Reb Arthur was saying: But more important, remember — You never know! Give your self over to a moment, and you might transform your self. Or someone else. Or the world. I took this poor, out of focus telephoto picture last November at Occupy Wall Street. 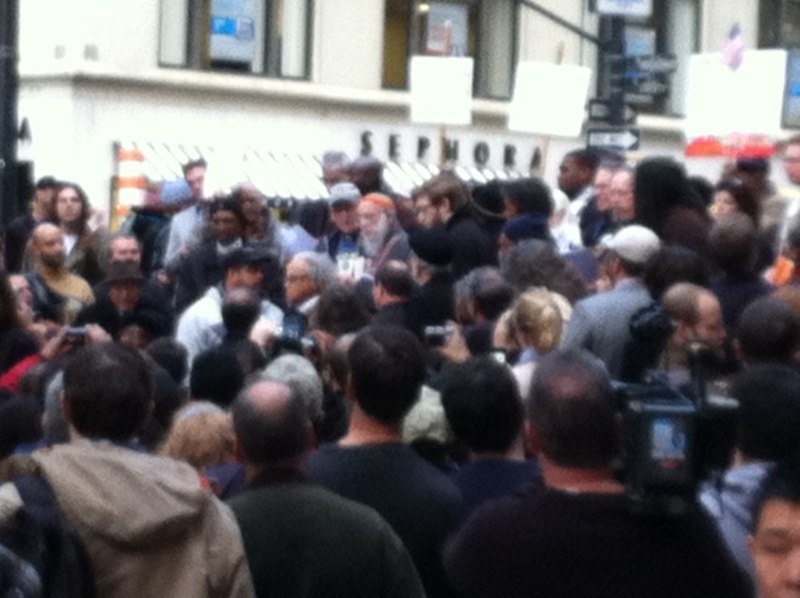 The man with the religious head covering and long white beard (top-center) is Reb Arthur, addressing the crowd. This entry was posted in EMS, Personal, Police, Something I Read and tagged children, EMS, family, kids, love, Parenting, police, Teaching. Bookmark the permalink. Thank thee, Paul. This has given me hope today, which I sorely needed. I hope you have been keeping well. What a heartfelt post. Beautiful as always. Nice to hear from you; I panicked about you when your blog was taken down! Glad to see it was all a mistake.